Rebalance Investment Committee member Professor Burton Malkiel talks with NPR’s Robert Siegel about his best-selling book, A Random Walk Down Wall Street, and stands by his central message: investors who buy index funds do better than all the stock pickers and Wall Street pundits. In 1973, Burton Malkiel published a very readable guide to investing called A Random Walk Down Wall Street. He didn’t rest with the first edition, though. 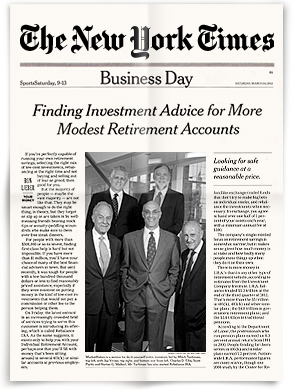 Over the past 42 years — as we’ve lived through bubbles and crashes, scandals and fads — Malkiel has returned more than a few times to his seminal Walk. In fact, this year he plans to release the book’s 11th edition. Despite the many iterations, he’s standing by its central message: The investor who buys and holds a broadly based index fund, who effectively invests in the market as a whole, does better in the long run than all the stock pickers and Wall Street pundits. Basically, the efficient market theory says that there are a lot of smart people around the world and that if information arises about a particular company or about an economy, that information gets reflected in market prices without delay. … You won’t have time to read the news and get in. The market is very efficient at digesting news. Now, that doesn’t mean that market prices are always correct. In fact, they’re far from perfect. But the point is, it’s very efficient at reflecting news, and if they’re incorrect no one knows for sure whether they’re high or low. Therefore simply buying a portfolio of stocks, given the tableau of market prices that you have at any point in time, is likely to give you a better performance than trying to go and pick stocks and buying one stock and selling another. Markets are not always correct! Markets are often wrong. Markets don’t anticipate the things that happen. [But] if you look at the whole of active managers — including highly paid hedge fund managers — you don’t see that they, over the long pull, have outperformed a simple strategy of buying and holding all the stocks in the market. I think that for most people who are saving for retirement, they’re going to be investing year after year after year. And so for those people, while everyone prays for higher stock prices, you actually ought to pray for lower stock prices. … So, for people who are accumulating a retirement fund, it’s just fine if the market goes up and down. Yes, you’ll buy some things at the top, but then you’ll also then buy some stuff at the bottom. The only people who should pray for higher stock prices are people who are in retirement who are liquidating their portfolios. Everybody else should actually be very happy when stock prices go down. ROBERT SIEGEL, HOST: Back in 1973, Burton Malkiel published “A Random Walk Down Wall Street.” The book was a very readable guide to investing, rooted in the efficient market theory. He’ll explain that in a moment. Over the past 42 years, as we have lived through bubbles and crashes, novel investment instruments, scandals and fads, Burton Malkiel has been updating “A Random Walk” and standing by its central message. The investor, who buys and holds a broadly based index fund, who effectively invests in the market as a whole, does better in the long run than all the stock pickers and Wall Street pundits. Well, this year, he’s up to the 11th edition of “A Random Walk Down Wall Street,” and Burton Malkiel joins us from Princeton, New Jersey, where he is a professor of economics. Welcome to the program. SIEGEL: And first, a brief definition of the efficient market theory. MALKIEL: Basically, the efficient market theory says that there are a lot of smart people around the world and that if information arises about a particular company or about an economy, that information gets reflected in market prices without delay. So that if, let’s say, a drug company has developed a drug that will give that company double the value that it had before the announcement, the price will double right away. It won’t double slowly over time. You won’t have time to read the news and get in. The market is very efficient at digesting news. Now, that doesn’t mean that market prices are always correct. In fact, they’re far from perfect. But the point is it’s very efficient at reflecting news, and if they’re incorrect no one knows for sure whether they’re too high or too low. And therefore, simply buying a portfolio of stocks, given the tableau of market prices that you have at any point in time, is likely to give you a better performance than trying to go and picks stocks and buying one stock and selling another. SIEGEL: Now, you do acknowledge in the book that George Soros and others looked at the crash of 2008 – the near collapse of the international financial system – and said, so much for efficient markets. Academic models of the economy didn’t see disaster coming. This thinking – efficient markets -stands accused of contributing to, if not causing, the financial crisis – to which you say? MALKIEL: To which I say markets are not always correct. Markets are often wrong. Markets don’t anticipate the things that happen. If you look at the whole of active managers, including these very highly paid hedge fund managers, you don’t see that they, over the long pull, have outperformed a simple strategy of buying and holding all the stocks in the market. SIEGEL: One school of thought that has grown up in the years since you first wrote “A Random Walk Down Wall Street” is behavioral economics and behavioral finance. You devote a chapter to it in the book. Should our confidence in the efficiency of the market be tempered by the idea, backed by lots of research and granted a Nobel Prize, that we typically are very irrational in economic behavior? MALKIEL: We are indeed irrational in many things. And in fact, part of the reason for putting a chapter on behavioral finance in is to protect us from what we have learned about our irrationality. And one of the parts of irrationality that is very clear – the evidence is crystal clear that when we are optimistic, we tend to buy stocks. When we are pessimistic, we tend to sell them. More money went into the stock market at the height of the Internet bubble in early 2000 than ever before, and more money came out of the stock market in the third quarter of 2008, at the height of the crisis, than ever before. So what we learn that we’ve done is we put the money in at the top. We tend to take it out at the bottom. And what I’ve always recommended is you just buy that portfolio and you hold it through thick and thin, and that gives you a superior performance to anyone who tries to pick individual stocks and tries to get in and out of the market based on their view whether the market is too high or too low. SIEGEL: At one point you quote Warren Buffett, the investor, with a wonderful analogy that – he says, if you know that you’re going to eat a lot of hamburgers, and you are not a cattleman yourself or in the beef business, you’d like to see the price of beef be low rather than high. So if you’re going to buy a lot of stocks, you want to buy when the price is very low rather than when it’s very high, but that’s exactly the opposite of what people do. MALKIEL: Exactly. And I think for most people who are saving for retirement, they’re going to be investing year after year after year. And so for those people, while everyone prays for higher stock prices, you actually ought to pray for lower stock prices because it’s as if the hamburgers you’re going to buy next year – do you want them to be more expensive or less expensive? So for people who are accumulating a retirement fund, it’s just fine if the market goes up and down. Yes, you’ll buy some things at the top, but you’ll also then buy stuff at the bottom. The only people who should pray for higher stock prices are people who are in retirement who are liquidating their portfolios. Everybody else should actually be very happy when stock prices go down. SIEGEL: Burton Malkiel, thank you very much for talking with us today about the latest edition of the book. MALKIEL: My pleasure. I thank you very much. SIEGEL: The book is A Random Walk Down Wall Street. Burton Malkiel is professor of economics at Princeton University.